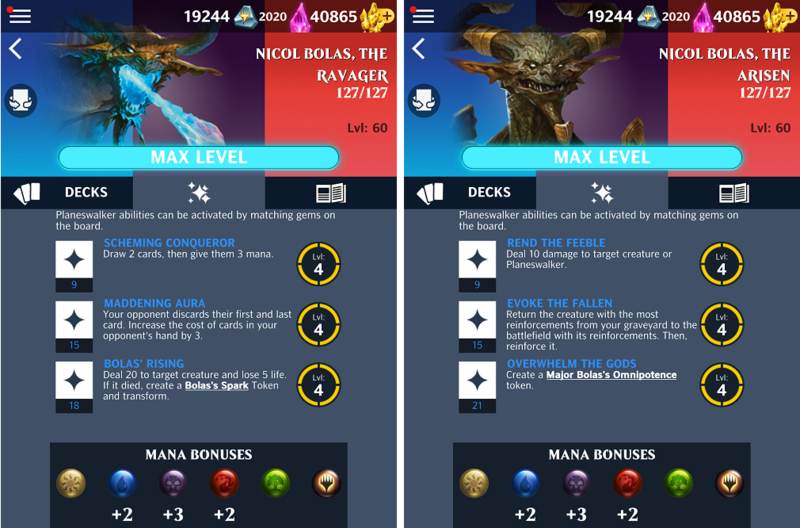 Magic: Puzzle Quest 2.8 Update is Here! - D3 Go! 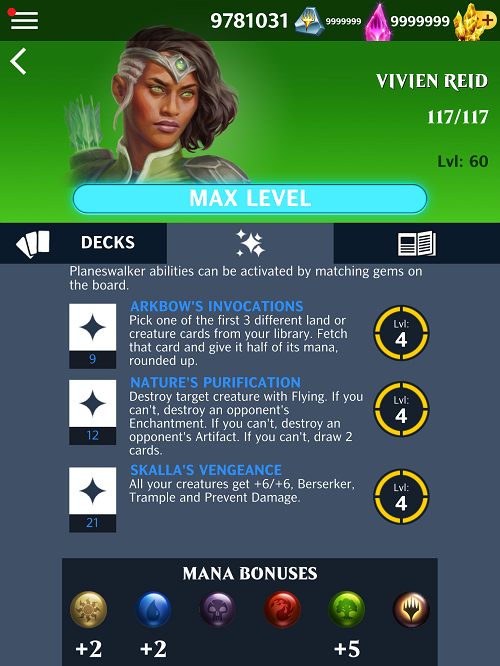 MAGIC: PUZZLE QUEST 2.8 UPDATE IS HERE! *Since the Communications team will be busy traveling to Gen Con tomorrow, we have decided to post the Final Release Notes a day early. Enjoy! Currently when you match gems, the “+X” mana gain prompt appears over the gem board itself. This can sometimes be hard to see, due to the color palette of the board, and the other variety of information present on it. With this change, the mana gain prompt will appear next to the card it’s filling up, and loyalty gain prompts will appear next to your Planeswalker’s image. During our tests, we noticed that a large number of first-time players were unaware that they could rearrange cards in their hand. 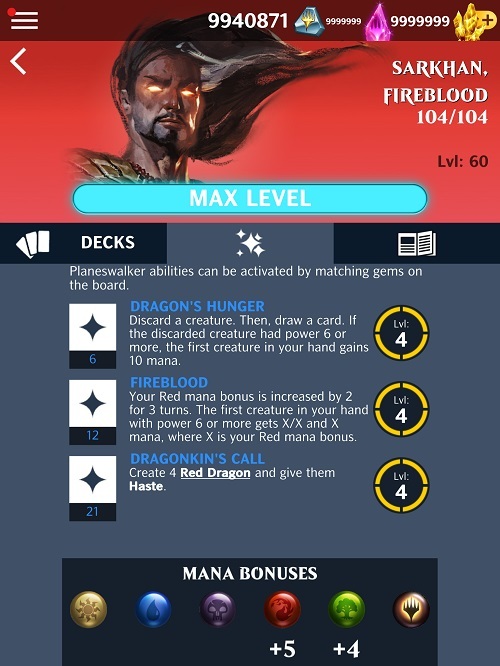 This had a significant impact on their play experience, so we are adding UI indicators next to cards to more clearly signify that they can be rearranged. By popular demand, we have now added the number of Shields a Support has onto the card itself. Also by popular demand, Coalition Leaders will now have the option to change who is the Leader in their Coalition in-game. We discovered an issue where all Supports display the wrong Shield amount outside of a battle, however once in-battle, they will display the correct amounts. We unfortunately were unable to get the fix into this build, however we will be sure to include this in the following 2.8.1 build. Join us as we uncover the contentious history between Nicol Bolas and his twin brother Ugin. Core Set 2019 is officially coming to Magic: The Gathering – Puzzle Quest, and with it comes 6 new Planeswalkers, 2 new Events, and 212 brand new cards! With Core Set 2019’s arrival, the card sets within Standard will be changing. Hour of Devastation will no longer be in Standard, and Core Set 2019 will be rotating in! Origins will still remain in Standard. Almost before time itself, the conflict between the Elder Dragons tore the fabric of countless planes. Becoming a Planeswalker, Nicol Bolas emerged victorious, one of the few survivors. Since then, the god-like Bolas has risen to be the most powerful dragon between planes, conquering thousands of realms, followers and immeasurable magic knowledge. Perhaps the oldest Planeswalker in existence, Nicol Bolas rules over multiple planes and hoards incalculable treasures. When rifts in time threatened Dominaria, Bolas helped heal the plane, sacrificing his omnipotence and immortality. Mortal, but still a dragon, he used his magic knowledge and intellect to woven schemes that would lead him back to divinity. Bolas’s Spark: This support can’t be destroyed or exiled. At the beginning of every turn, gain 2 Loyalty. Major Bolas’s Omnipotence: At the beginning of every turn, this support loses 1 shield. Your opponent can’t draw cards. Ajani Goldmane’s magic purifies the body and soul, evoking his allies’ inner essence. On his homeplane of Alara, he confronted and defeated Nicol Bolas by turning the dragon’s soul against him. Driven by his sense of justice, Ajani joined the Gatewatch and became an advisor to leonin communities on many planes and a mentor to other heroes, particularly Planeswalkers. 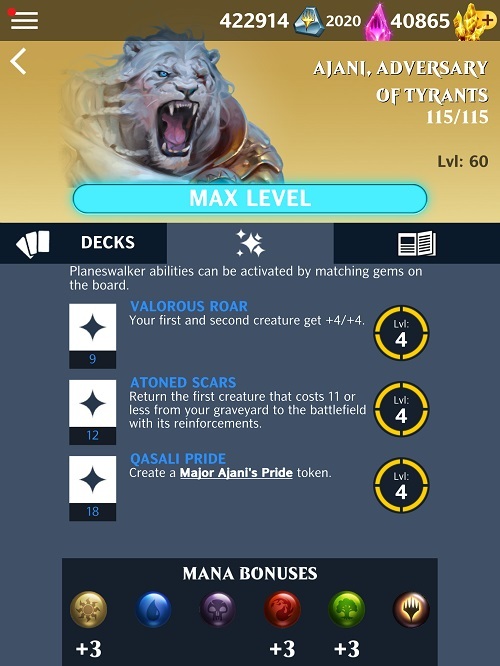 Major Ajani’s Pride: At the beginning of your turn, create 6 Cat tokens. Liliana Vess specializes in the power of death, reanimating corpses and corrupting the living. Her desire to avoid her own death led her to another powerful Planeswalker: Nicol Bolas. Bolas brokered a pact between Liliana and four demons from the Multiverse, giving her immense magical power and ageless life. Subsequently, she resolved to free herself from the demons’ control by any means necessary. Sarkhan Vol’s obsession with dragons led him to pledge loyalty to the mighty Nicol Bolas. But Ajani’s victory over his master made his mind start to unravel. He was sent to Zendikar, where his festering madness contributed to the release of the Eldrazi – all according to Bolas’ secret plan. Sarkhan returned to his native Tarkir, travelling into ancient history to restore the dragons to his home plane. Native of the plane of Alara, Tezzeret is an artificer and master of etherium crafting. While young, he replaced his own arm with an artificial etherium limb. He agreed to serve Nicol Bolas in exchange for power, and most recently was integral to the construction of a device to open portals between planes. Although Bolas’s enemies though the device was destroyed, Tezzeret incorporated the mechanisms into his body, becoming a planar bridge himself. Major Tezzeret’s Craftsmanship: At the beginning of your turn, fetch the first first creature and support from your library. They gain full mana. Vivien is a guardian and guide from the once forested plane of Skala, ravaged by arrival of Nicol Bolas. Vivien’s mentor imbued her arkbow with invocations in a desperate attempt to repel the ragon. As the woodland burned, her Planeswalker spark ignited and she became a guide to the forests and animals of the Multiverse, using her arkbow’s invocations to her defense. Stored Mana cards will store mana above their base cost up to a maximum, and can only be cast if their stored mana is 1 or more. Players will have an opportunity to cast spells with this ability, if they reach max Stored Mana due to cascades and/or other effects, regardless of the auto-cast. This will allow players a chance to immediately cast them, if they get lucky on their matches. Choose your side on the Dragon War and make alliances with the Elder Dragon to subdue your foes. Each node allows only a specific combination of colors related to that dragon, and gives the player special abilities that are triggered whenever he or she activates a Planeswalker ability. 1st Ability: Draw a card, then give it X mana. 2nd Ability: Your creatures gain Flying and Vigilance until the beginning of your next turn. 3rd Ability: Your creatures get +X/+0, where X is equal to their toughness. Summon X or more Creatures during a single turn. Cast X creatures with toughness Y or more. 1st Ability: Cards in your hand can’t be drained, raised, or discarded by opponent’s effects until the beginning of your next turn. 2nd Ability: Creatures you control lose all their buffs and gain Hexproof until the beginning of your next turn. Cast X or more Spells during a single turn. Cast X spells with cost Y or less. 1st Ability: Deals X damage to your opponent’s Planeswalker. 2nd Ability: Return the first creature from your graveyard to play under your control. 3rd Ability: If your opponent would draw cards during their next turn, you draw that many cards instead. Those cards gain full mana. Deal X damage during a single turn. Win with only cards that cost X or more mana. 1st Ability: Destroy an Enchantment support your opponent controls. 2nd Ability: Destroy an Artifact support your opponent controls. 3rd Ability: Destroy the first creature your opponent controls. Cast X supports with cost Y or less. Cast X creatures with cost Y or less. 1st Ability: Your first creature deals damage equal to its power to the first creature your opponent controls. 2nd Ability: Your creatures gain Berserker, Trample, and Prevent Damage until end of turn. Cast X creatures with power Y or more. Cast X or more damage to creatures during a fight. You asked for it, and now it’s finally here! 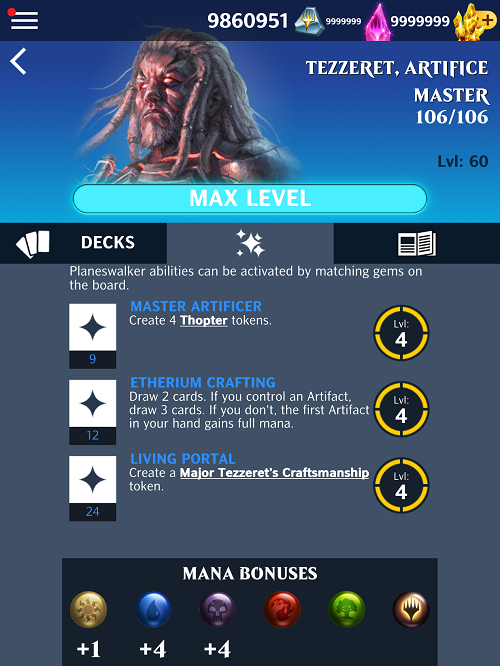 Test your Standard deck in the new Standard version of Training Grounds. Train as much as you like and earn some Mana Runes while doing so. There are no secondary objectives, and the goal is just to win! All cards that had Cycling 1 now have Cycling 2. New Perspectives now costs 7 and adds only 1 mana to Cycling cards. Drake Haven now makes a single token and costs 8. These changes should keep the strategy viable while making it require more setup to achieve the best results with it. The following change-list describes overall changes to several cards in the game. Most of these changes are slight adjustments to cards that felt underpowered or overpowered. Lands requisite changed to 3. Only target the player’s own creatures..
After identifying that certain Lands in the game had conflicting costs, we found this was a good time to review and change their overall value. The following change-list has mostly buffs for all Lands in the game, and should make low count gem converting more accessible to all colors, whereas large count gem converting remains a (mostly) green aspect. Gained the Desert subtype in addition to Land. All Activates changed to 2. Added the Plains and Forest subtypes. Added the Plains and Island subtypes. Added the Swamp and Mountain subtypes. Added the Swamp and Island subtypes. To celebrate the arrival of Core Set 2019, we will have a brand new selection of special offers available. Keep an eye out in the Vault, so you can snag them while you can! Fixed an issue with Awaken ability. Fixed an issue with the first card in the player’s hand being discarded when matching Merciless Eternal’s Activated gem in Battle; it now remains in their hand. Fixed an issue where players will lose their original opponent, when internet connection is lost, while an event is loading. Fixed an issue with the app freezing when rapidly selecting the Purchase button many times in Booster Crafting. It now proceeds to the new card screen. Fixed an issue where the player can purchase multiple cards at the same time, when pressing the Purchase button repeatedly in Booster Crafting; now the button can only be pressed once. Fixed an issue with Jhoira, Weatherlight Captain’s ability remaining inactive after reinforcing her in Battle. Fixed an issue with Felidar Cub being destroyed, when matching Felidar Cub’s Activated gem while the opponent has no Support gems on the board in Battle. Fixed an issue with a server error occurring when finishing Pits of Nightmares in the A Journey Through History: A Nightmare of War Event; the game now proceeds to the Rewards screen. Fixed an issue with the Defeated prompt displaying twice when losing The Brothers’ War encounter after the opponent activates the Golgothian Blast ability in the A Journey Through History: The Long Cold Darkness Event. Fixed an issue with gems converting to the opponent’s colors when beginning the player’s turn while Naga Vitalist is on the player’s battlefield; now it’s converted to the player’s colors. Fixed an issue with an infinite Cycling combo being possible when Cycling cards while Drake Haven, New Perspective, and Curator of Mysteries are on the field. Fixed an issue with cards in the player’s hand switching positions when beginning the match in multiple Training Encounters; now it remains in a set position. Fixed an issue with Depths of Desire being cast, instead of remaining in the player’s hand, when selecting the Not Now button in the Confirmation prompt. Fixed an issue with Ryusei, the Falling Star’s effect remaining inactive, when it is destroyed at the end of the turn after it was summoned by Flash’s effect. Fixed an issue with the Awaken ability remaining inactive, when casting a Spell card with Awaken that has the second bar of mana filled in Battle. Fixed an issue with the player taking 60 damage, instead of 30 damage, when the player’s Lich’s Master Support gem is destroyed, while the opponent is Enraged in Battle. Fixed an issue with 6 mana being gained, instead of 3, when a Historic card is fetched after the Weatherlight deals combat damage in Battle. Fixed an issue with Fiery Intervention remaining inactive, when casting it while an indestructible Event Support is the opponent’s only Support gem on the board in Battle. Fixed an issue with the player gaining life, instead of only drawing a card, when gaining life while Lich’s Mastery and Alhammarret’s Archive are on the board; now it only draw a card. Fixed an issue with the Masterpiece cards being missing, when viewing the Rivals of Ixalan booster pack’s available cards in the Vault. Fixed an issue with Infectious Curse remaining inactive, instead of giving the player 3 mana, when casting a Spell that targets the opponent’s Planeswalker in Battle; now the player gains 3 mana. 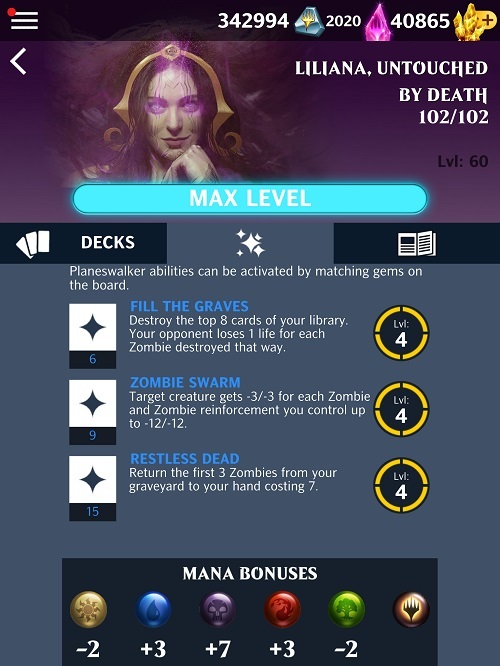 Fixed an issue with Corrupt being a valid ability to activate, when activating Liliana, Deviant Necromancer’s Corrupt ability, while the player’s hand is empty in Battle. Fixed an issue with Sorcerer’s Wand dealing 4 Damage, instead of 3, when beginning the player’s turn, while a Wizard Creature card is on the player’s battlefield; now it deals 3 damage. Fixed an issue with Support cards transforming being considered a card that is cast. Fixed an issue with Training Grounds not crediting 50 Mana Runes when you lose a match. Fixed an issue with Creatures remaining Disabled, when casting Gift of Growth on a Disabled Creature in Battle. Fixed an issue with the Player being able to move cards in their hand, when dragging any card in the player’s hand, during the first turn in multiple Training Encounters. Fixed an issue with Hungry Flames displaying as valid to cast, instead of invalid, when it has full mana while the opponent controls no Creatures in Battle. Fixed an issue with Eliminate the Competition displaying as valid to cast, instead of invalid, when it has full mana while the opponent controls no Creatures in Battle.